Your panels capture energy from the sun’s radiation and turn it into DC electricity, which is sent to your inverter. Your inverter creates usable AC power and distributes this to your home’s switchboard for use, and any excess not needed to the grid. 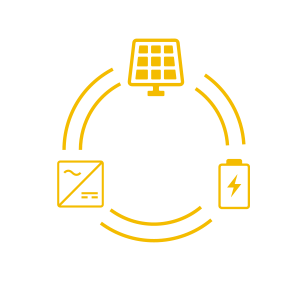 Your inverter creates usable AC power and distributes this to your home’s switchboard for use, then to the home battery for storage, and any excess not needed to the grid. The energy stored in the home battery is used at night or during power cuts. Your inverter creates usable AC power and distributes this to your home’s switchboard for use, then to the home battery for storage. Every home, business and the people in them have different power needs, and different sustainability goals. 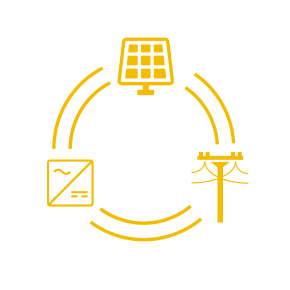 We relish the challenge of taking a brief from you and specifying the ideal solution, be it grid-tied, hybrid or off-grid. Get in touch for a FREE, no obligation assessment and we can specify your ideal solar solution.